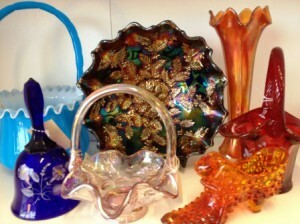 Collectors of Fenton glass can find a wide variety to choose from at the Albany Antique Mall. One of the Dealers specializes in finding and selling Fenton while many others bring in beautiful pieces here and there. Fenton is one of those companies that produces so many wonderful pieces in so many wonderful colors that anyone can find a piece to fit in their own décor. Fenton Art Glass Company is the largest manufacturer of handmade colored glass in the United States. The company was founded in 1905 and began by painting designs on glass blanks they purchased from other glass manufacturers. By 1907, because of the need for more glass, they opened their own glass company. The factory was in Williamstown, West Virginia and their first glass was made on Jan. 2nd, 1907. It is because of the desire of the Fenton Company to produce new and unusual colors that make their glass some of the most sought after. They introduced iridescent glass in 1907. These days we refer to it as “carnival glass”. To this day the, Fenton Art Company is still making their beautiful artistic glass pieces. Come on in and find a vintage piece for yourself! Albany Antique Mall is a proud sponsor of the “Points for Profit” program. Located in historic downtown Albany at 145 2nd Ave SW. Find us on Facebook!